The sassy 1937 Chevrolet Cabriolet weighed in at 1265 kilos (2,790 pounds) and rode on a 2 844-millimetre (112-and-one-quarter-inch) chassis. The Great Depression had taken a horrific toll on Canada for eight long years. Its effects had devastated the national economy and drove millions of Canadians to their knees. Just when the worst appeared to be over, farmers on the Prairies suffered through another crippling drought in 1937. Unable to find work of any kind, nearly a million workers were still on the dole. Ontario was plagued with labour strikes including workers at GM Canada in Oshawa, who walked off the job on April 8. Premier Hepburn threatened to bring in the Royal Canadian Army to quash the strikers' action. The employees returned to work twenty days later when the company finally recognized the United Auto Workers’ right to bargain on the employees’ behalf. The dispute was settled but the stock market crashed again, bringing new misery. Used cars went begging. Want ads in the Hamilton Spectator showed Coronation Motor Sales Limited had a 1932 Plymouth Sedan on the lot for $365 and made a point of including the fact that all its salesmen were courteous and Canadian. MacLaren Motor Sales, Limited—the Chev-Olds dealer--at 70 John Street North in Hamilton, offered a dark green 1934 Ford Special De Luxe coupe with radio and heater for only $175 and was prepared to finance the purchase. That radio was particularly practical since the CBC was gearing up to expand its broadcast from six to sixteen hours a day. Even a second-hand automobile was just a pipe dream for many in 1937. Thousands of folks would eke another year or two out of their old jalopies with what repairs they could afford. Merrick Tire, located at 123 King Street in Hamilton, guaranteed its reconditioned tires with prices starting as low as $1.50 each. Hamilton Welding, at 100 Mary Street, straightened axles, frames and wheels to stop road shimmy. Jack Piries at 19 Market Street relined brakes and rebuilt clutches at reasonable prices. A paint job from the Ottawa Paint Shop in Hamilton started at $12. For the few who could afford a new 1937 automobile, the low-priced leaders--Chevrolet, Ford and Plymouth--were going to get the lion’s share of the new car trade. All three dealer bodies had been hit hard by the economic downturn and all were keen to put new taillights out the door. 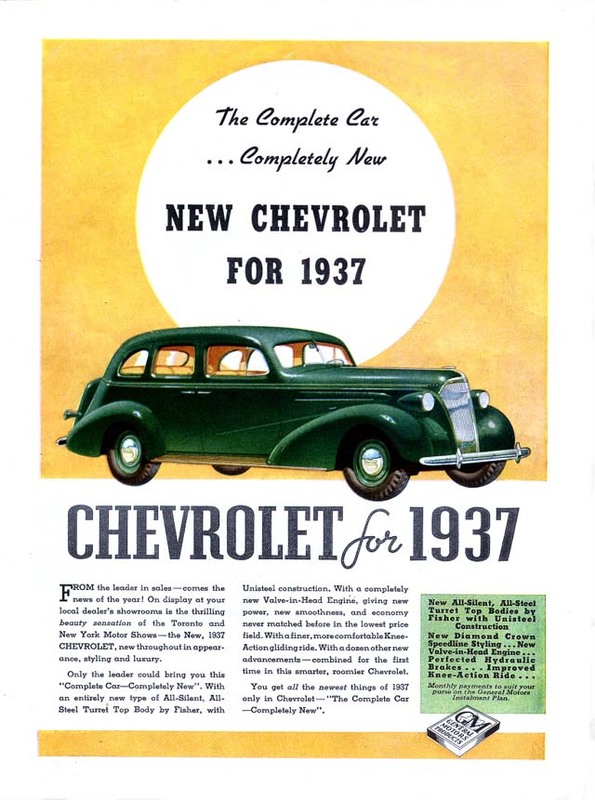 Chevrolet had hit rock bottom in 1932 when only 10,832 cars were produced. Only in 1916—the first year for the marque to be built in Canada—was production lower. Production inched upward painfully each subsequent year of the Depression. A total of 13,134 units was built in 1933 and 24,103 bowties rolled out of the Oshawa plant’s doors in 1934. 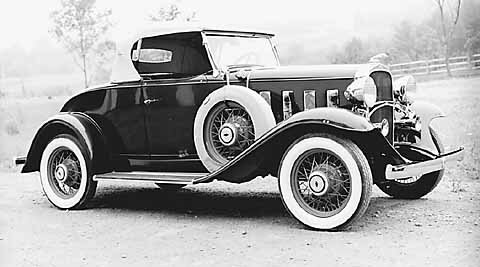 The picture grew brighter in 1935 as 33,721 Standard Six and Master Six units were produced. In 1936, the numbers moved up ever so slightly to 38,473 units. The 1937 Chevrolet two-door Master Coach weighed in at 1267 kilos (2,795 pounds). 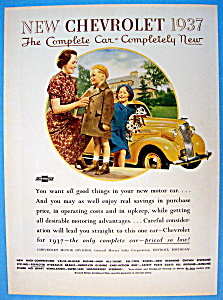 Chevrolet salesmen had a few rabbits to pull out of the proverbial hat for customers when they came to dealerships see the new 1937 models. They were, after all, the company’s 25th anniversary offerings. Billed as “the Parade of Progress,” the latest bowties from Oshawa featured safety plate glass windows and all-steel bodies by Fisher. Advertising drew attention to the fact that bodies were had been made lower, longer and roomier. Each one was constructed with a new six-girder frame, “built like a bridge span.” Chevs were dubbed as “all silent and all-steel.” The pleasant, Diamond Crown styling was the handy work of designer Jules Agramonte who had been the inspiration behind the beautiful 1934 LaSalle. Engineers tweaked Chevrolet’s Stove Bolt Six engine. Made of lightweight cast iron with a domed head and slipper skirt, the electroplated overhead valve plant now generated a whopping 85 horsepower. Advertising made much of the car’s economy, bragging that many owners reported more than 9.4 litres per 100 kilometres (25 miles to the Imperial gallon). 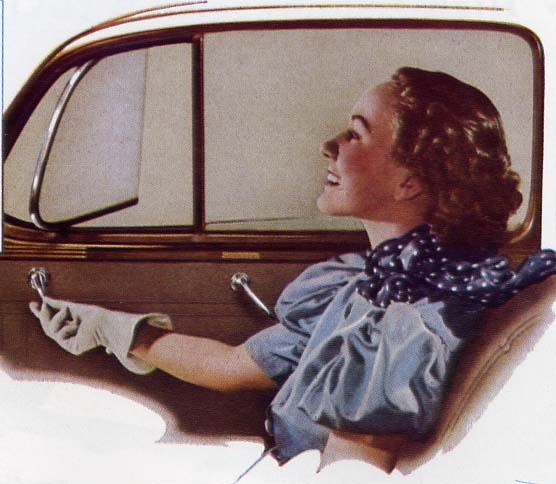 No-Draft Ventilation was a feature unique to GM cars throughout the 1930s. 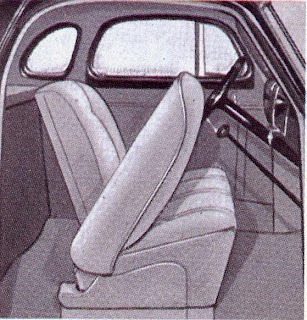 The small windows were invaluable in keeping cabin air fresh. All Chevs boasted the Fisher “draft-free ventilation system” which consisted of vent windows for and aft to “let air sweep freely through the car, or control a gentle circulation that exhausts stale air and tobacco smoke—and prevents windshield fogging.” Independent front suspension, treating passengers to “Knee-action gliding ride,” had been around on the higher priced Chevs since the 1934 model year. Advertising bragged that more than 2,000,000 users had proved it was the world’s safest, smoothest ride. This was the second year for hydraulic brakes to be fitted to all four wheels. While the Master DeLuxe got all the trimmings, lesser-priced Masters made do with older technology and fewer goodies. They carried the tried-and-true I-beam, straight axle setup instead of the fancy Knee-Action Ride. Not as well dressed, Masters wore less trim, got no rubber pads on the pedals, no ash tray and were blessed with only one taillight, one wiper and a single arm rest. Masters did without bumper guards and no “overheat” indicator on the instrument panel. The entry level, two-passenger Business Coupe listed for $745 at J. B. Ross Limited in Hamilton, Ontario. Of course, taxes, license and freight were all extra. Seven different models were offered in all, ranging from the Business Coupe to Sedans, Coaches, Town Sedans, Sport Coupes, Sport Sedans and a very racy Cabriolet. Surprisingly, the ragtop was offered in the lower-priced Master series. While all Chevrolets in the US were offered only on the 2 844-millimetre (112 and-one-quarter-inch) wheelbase, at least one Canadian source indicates that the Master Deluxe series sold throughout the Dominion was built on a much longer 3225-millimetre (127-inch) chassis. Perhaps a passionate reader can set the record straight. At the end of the year, Chevrolet had racked up production of 44,203 units. Most of the cars were sold in Canada. Ford produced 73,716 passenger cars, though 40,043 were exported throughout the British Empire.